You are currently browsing the tag archive for the ‘Augmented reality’ tag. 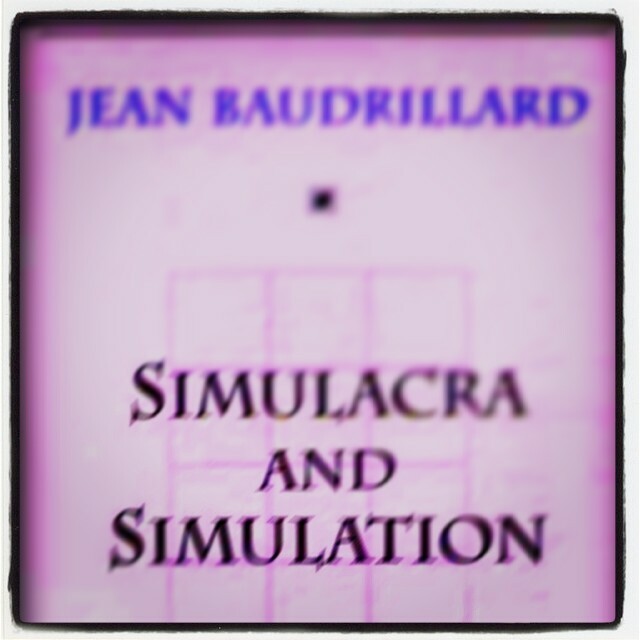 “Simulacra and Simulation” is definitely one of my best summer holiday readings I had this year. There are several connections to areas like Collective Intelligence and Perception, even Self-Organization as the dynamic and entangled use of symbols and signals, are recurrent on all these areas. Questions like the territory (cultural habitats) and metamorphose are also aborded. The book is an interesting source of new questions and thinking about our digital society, for people working on related areas such as Digital Media, Computer Simulation, Information Theory, Information and Entropy, Augmented Reality, Social Computation and related paradigms. I have read it in English for free [PDF] from a Georgetown Univ. link, here. 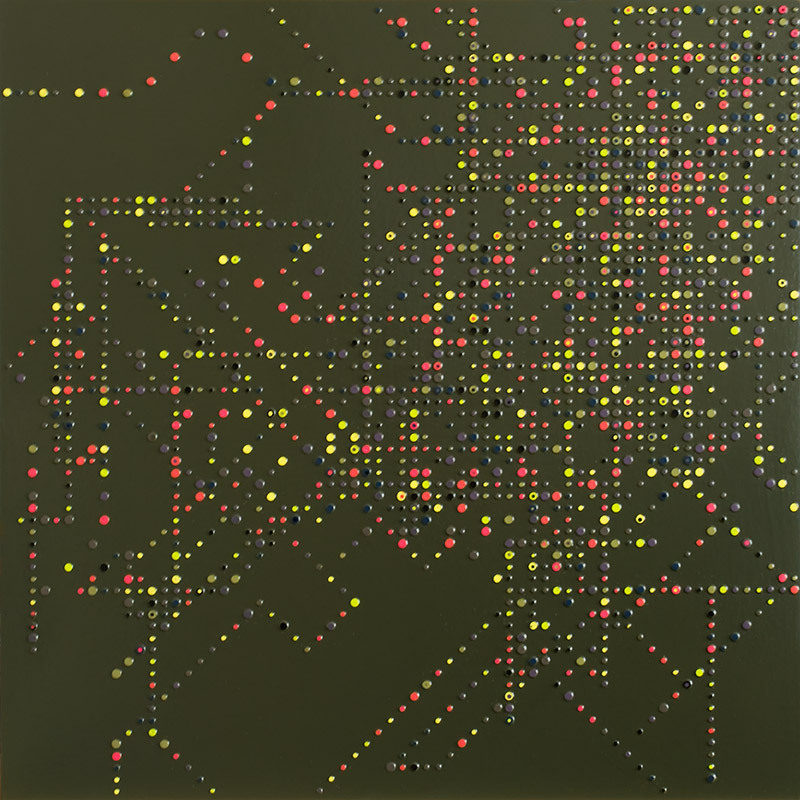 Image – Reese Inman, DIVERGENCE II (2008), acrylic on panel 30 x 30 in Remix (Boston, 2008), a solo exhibition of handmade computer art works by Reese Inman, Gallery NAGA in Boston. Synchronicity: Carl Jung coined the term synchronicity for the “simultaneous occurrence of two meaningful but not causally connected events” creating a significant realm of philosophical exploration. This attempt at finding patterns within a world where coincidence does not exist possibly involves apophenia if a person’s perspective attributes their own causation to a series of events. “Synchronicity therefore means the simultaneous occurrence of a certain psychic state with one or more external events which appear as meaningful parallels to a momentary subjective state”. (C. Jung, 1960). Pareidolia: Pareidolia is a type of apophenia involving the perception of images or sounds in random stimuli, for example, hearing a ringing phone while taking a shower. The noise produced by the running water gives a random background from which the patterned sound of a ringing phone might be “produced”. A more common human experience is perceiving faces in inanimate objects; this phenomenon is not surprising in light of how much processing the brain does in order to memorize and recall the faces of hundreds or thousands of different individuals. In one respect, the brain is a facial recognition, storage, and recall machine – and it is very good at it. A by-product of this acumen at recognizing faces is that people see faces even where there is no face: the headlights & grill of an auto-mobile can appear to be “grinning”, individuals around the world can see the “Man in the Moon”, and a drawing consisting of only three circles and a line which even children will identify as a face are everyday examples of this..